Hunger Games: Plum Stew for Katniss – An Alternative! I loved reading the Hunger Games – I think if you’re a foodie, you’ll really enjoy the descriptions that author Suzanne Collins put into her books. One of the dishes that stands out is the lamb stew that Katniss enjoys so much from the Capitol, and I’ve seen loads of recipes online which replicate it. However, I’m not a huge fan of sweet and savoury mixed together – unless there’s a whole bunch of spice added in! With that in mind, I really wanted to try a tagine version of this, since lamb and prunes is a fairly common combination. But then I was flicking through 50 Great Curries of India by Camellia Panjabi, and found a plum and lamb curry! Now, this is made with fresh plums, not dried, but the flavour is so delicious that I don’t think anyone will be complaining about accuracy! Here is the recipe, which I have adapted slightly to reduce the calories. The original called for more oil, more lamb, and more plums – I think it would be better with less, hence my changes. 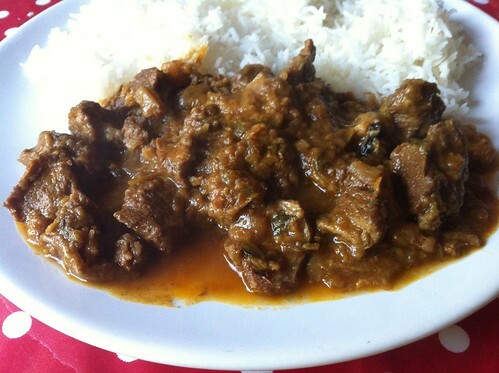 This stew is spicy and rich, and the sharp, sour taste of the plums really balances against the savouriness of the lamb. You can eat this with rice, or naan bread if you prefer. I’m planning on serving this at a Hunger Games-themed party I’m having next month, but you don’t really need an excuse to eat this – it’s great, and not too high in calories, either! Just make sure that you go easy on the oil, and that the lamb is very lean and trimmed of all excess fat. Heat oil in a deep pan and add the onions, frying until they’re golden brown – around 10-15 mins. Add the garlic, ginger, cloves, cardamoms, cinnamon, and green chillies. After one minute, add in the turmeric, coriander and chilli powder, and stir well. Add the lamb to your spiced, aromatic mixture, and fry for five minutes. Then, cover and cook for about 10 minutes, or until the lamb is semi-dry. Stir well to make sure everything is coated and beginning to go golden brown. Add the plums and stir. Follow with 2 tbsp of coriander leaves, and the lamb stock, then simmer on low for 30 minutes. Serve sprinkled with additional coriander, and serve with rice. You can freeze this recipe, which serves four! The calories work out at 312 per serving.